Working, as we do, with a client inventory that spans suburban bungalows, condominiums, back splits and city centre semis, we've problem solved every decorative issue that bad taste can muster. 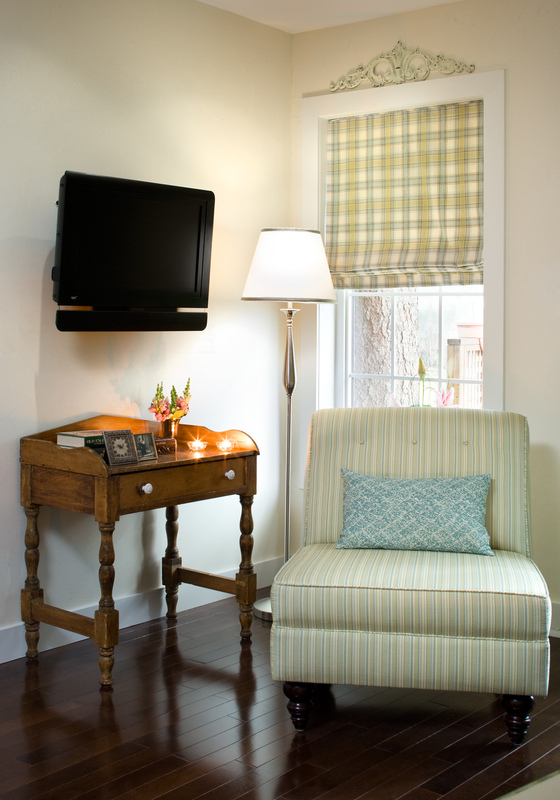 Here's a quick roundup of pointers that should help make better of any small space, cottage inclined or not. Yay! The Fall Cottage Life Show: throwing open its hallowed portals, once again, at The International Centre, Toronto. 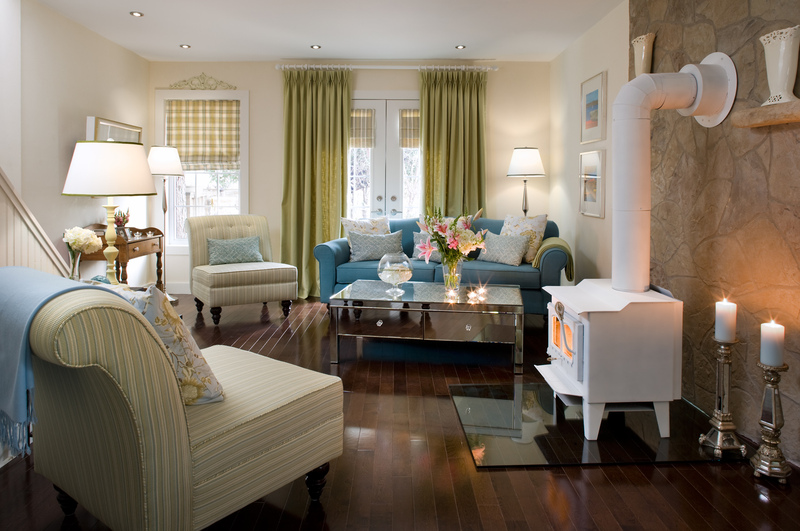 The action packed event in mind, we thought it'd be fun to appraise how you can create the cottage vibe, no mater the style -- or location -- of your current abode. Working, as we do, with a client inventory that spans suburban bungalows, condominiums, back splits and city centre semis, we've problem solved every decorative issue that bad taste can muster. There's little we like better than taking a dowdy (less than) des' res' and making it rise, phoenix like, from the ashes of style negative neglect. Put simply, home rebalancing is our raison d'être. We decorate, therefore we are. And so it came to pass that, on the winds of designer ambition, we heard the frantic call of Laurie, a psychiatric nurse with a problematic city pad. With her parents' beloved cottage recently sold, she hoped we'd invent a cottage vibe in her urban nest that would (in some way at least) reflect the casual charm of the hideaway in which she'd spent many happy vacations as a child. Her strict instruction? To utilize a muted colour palette of mid-tone blue and softest green. And to maximize the feeling of space wherever possible. 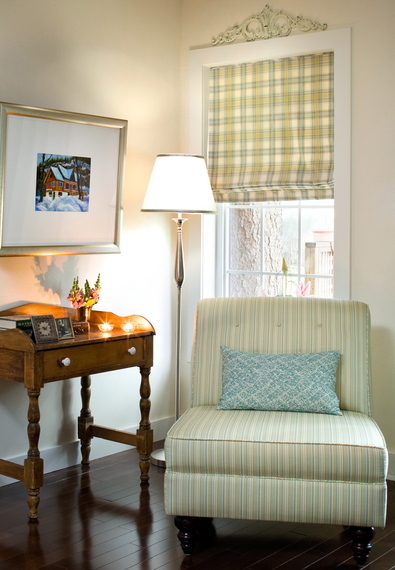 Before examining the minutiae of this week's mini marvel, here's a quick roundup of pointers that should help make better of any small space, cottage inclined or not. Go easy -- keep big colour to a minimum. Accent walls are one thing but all-round coverage with heavy, saturated tones is enough to suffocate any room. Opt for shiny floor finishes -- these max up light and in doing so 'enlarge' space challenged zones. Let there be light -- peppering your ceiling with pots will spread illumination better than single pendants. Pare back -- select sofas with thinner arms to amplify bum space. 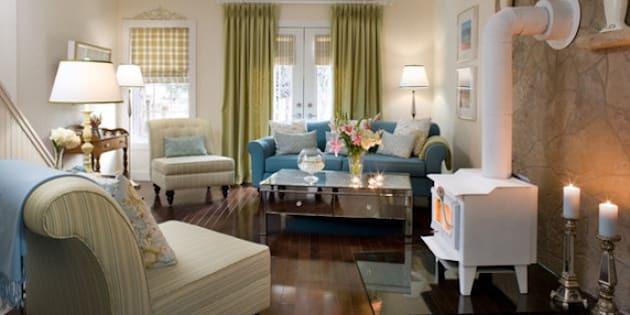 And opt, if you can, for couches that are jacked up on legs so light can pass underneath. Reflect -- mirrored furniture bounces light to 'enlarge', via reflection, while glass furniture will appear to float and consume far less space than solid equivalents. Purge and minimize clutter -- substitute overrunning collections for a few carefully selected statement pieces. Tricks of the trade -- 'widen' a narrow room by laying floor boards cross ways or 'elongate' a short room by laying boards along the length of your space. Paint and paper -- vertical stripes 'lift' rooms where head height feels restricted while horizontal stripes will 'stretch' walls. 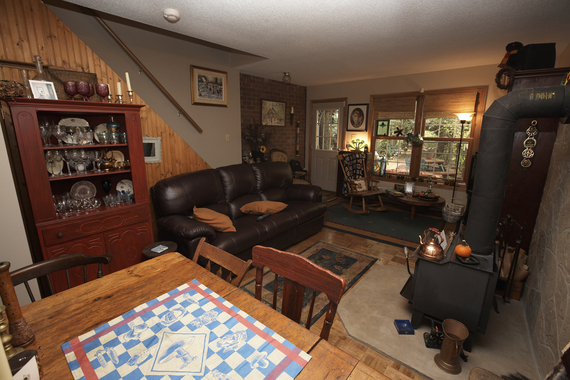 To improve garden access, we replaced the large window with double French doors. A structural report revealed that this entire elevation had steel beams and our enabling work was therefore simplified. Next, we converted the existing door into a window by building a dwarf wall and installing a double glazed unit. First thing to go was the fake brick, which we dry walled to simplify proceedings. Its removal instantly modernized and the results, we feel, speak for themselves. Our colour choice? Purest simple cream. Very cottagey, very calming and very easy to accessorize around should tastes change further down the line. Our new upholstery offers better accommodation than the previous chunky burgundy affair, which had all the allure of a lump of liverwurst. We've always had an inbuilt allergy to 'pleather', not least because, as kilt wearing Scots, we have adhesion issues each time we sit down. Nice. Still chasing the spirit of all things 'cottage', we specified fabric and custom designed chairs without arms. These provide loads of comfy relaxation space but take up way less room. Our sofa, again a bespoke item, boasts lean lines yet is every bit as yielding as its predecessor. We'll happily buy 'off the shelf' when proportions are generous, but reckon it's worth investing in tailor-made pieces when space is restricted. 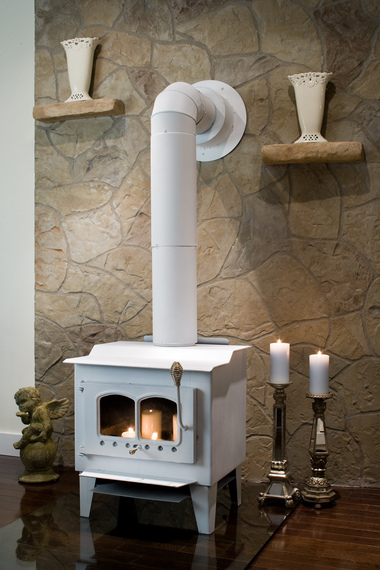 As long as -- and only if -- you use specialist heat resistant paint, there's no reason you can't update the exterior of a standard log burning stove. To brighten Laurie's living room, we painted the previously black appliance using softest cream and it immediately makes our project 'pop'. As another modern twist in an otherwise traditional space, we specified heat resistant toughened glass as a bed for the stove and its easy clean finish makes maintenance a breeze. Quite the transformation, eh? Now you see it now you don't! Still missing her childhood cabin, Laurie, for posterity, took it upon herself to capture the cute chalet in oil. We copied and enlarged the image then mounted it within a simple frame built from with lumber (air vented of course) to create a retaining lip. When the TV is off the artwork is centre stage, but when Laurie fancies a spot of recreation, she only has to whip off the cover to settle in front of her favourite show. Pinch top drapery set on a white timber pole proffers a fuss-free look, while checkered blinds create a complementary and elegant layer. We chose a mirrored coffee table with drawers to tame some of our girl's clutter and stuffed vases with casual florals to add further country charm. Mirrored candlesticks, naïve framed artworks and a collection of throws and cushions are the finishing touches that ensure a casual relaxed look. If you're suitably inspired after today's decorative master class, head to The Cottage Life Show as a matter of critical urgency. You'll find more than 200 exhibitors spanning metal roofs to septic systems, hot tubs to floating docks, and kitchens to bathrooms. Aye, it's a mesmerizing mix of inspiration and seminars hosted by industry experts, celebrity chefs and respected TV names. Come on: what better way to get you through winter, than to start planning... for next spring. Enjoy! Now Where's That Hidden TV? A beautiful cottage often has an even more-beautiful garden. Cedar shingles are a classic cottage detail that never goes out of style. Cottages often have porches, which are the ideal place to watch summer go by. A shorefront cottage is the ideal getaway. Cottages can have plenty of room for secret spaces -- like attic rooms and small balconies. A wraparound porch is also a great place to relax. Shutters can make any home look adorably quaint.